Many of you know from my profile that I am not a huge fan of legumes. In fact, there are only a few types that I actually enjoy eating, namely red lentils and black beans. During the early days of the recent Haiti crisis I decided to make rice and beans for the children to experience something of what the normal diet is in Haiti. Without realizing it, I discovered a simple supper or lunch that was easy to make and really delicious. We've eaten it numerous times since. Get the rice started -- I use a rice cooker which means I just throw in rice and water, turn on the cooker and leave it until we are ready to eat. Dump the beans and salsa into a saucepan. Add cumin to taste and heat through. Serve over cooked rice with grated cheese on top. If you want to get fancy you can add other toppings such as chopped tomato, chopped onion, sour-cream, chopped avocado, shopped cucumber, shredded lettuce, or sliced black olives. This has been a staple in our home for years (stolen from Anne Judd). 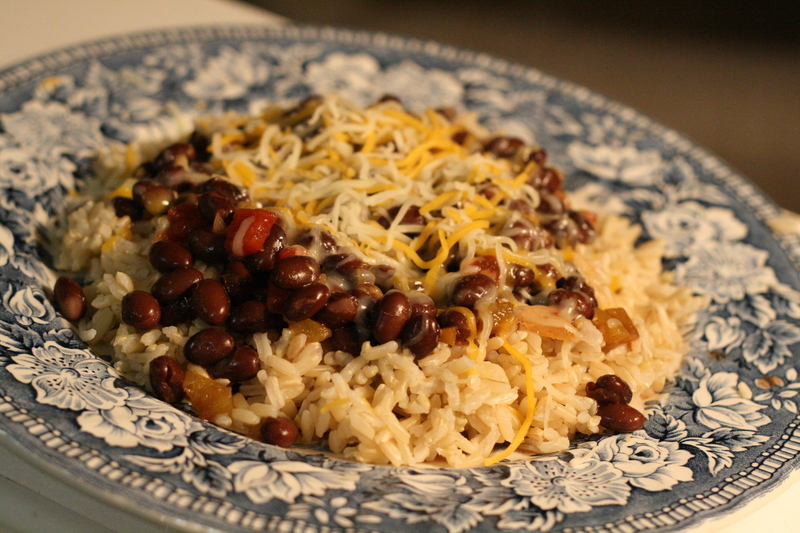 However, we use dried black beans which makes it extremely economical. I put an assortment of ingredients to layer on the table (chopped tomatoes, onions, avacado,black olives, cucumber, and ALWAYS, sour cream) so people can fix it as they please. Also, a staple in our home (stolen from Anne Judd) =) It's great thrown in a flour tortilla with some lettuce to mix things up a bit. What timing! We're having beans and rice for dinner tonight! Like Laura, I start with dried beans - once a month or so I cook up a huge pot of them and then freeze them in two cup containers to use whenever I need a "can" of beans. This is also great served over bulgur (wheat product). What makes it advantageous over rice is that you just boil water, once boiling dump in bulgur, turn heat off and let sit until ready for dinner. Ratio is 2:1 (water:bulgur). That looks really yummy! The salsa is a nice touch.